Epsom salts are naturally occurring mineral compounds with the chemical formula of magnesium sulfate. They have a wide range of applications including as hair volumizers, treating fungal infections, helping to relieve aches and pains, exfoliating skin in the form of facial scrubs and Epsom salt baths that can detoxify and relax the body. What’s more, it is said that drinking Epsom salt can help relieve constipation or cleanse the colon. Can You Drink Epsom Salt? Epsom salts can easily be found at the local grocery store or drug store and they are also affordable. You can drink Epsom salt for it will relax your digestive muscles and provide laxative effect. Drinking Epsom salts can also help detoxify your liver but any time you do a detox using the salts, it is important to remember you will need two days. One day will involve the detoxification process and the other is necessary for resting. You should also stop taking any supplements or medications you are on two days before you do your detox. The term given to describe a solution made using Epsom salt is “hyperosmotic.” Epsom salts act like any other salt and this means that they attract water. Therefore when they pass through your bowel system, the salts will pull the water from other areas of your body, increasing the amount of lubrication found within your digestive system. The increased lubrication leads to increased excretion. Take three cups of water and mix in four tablespoons of Epsom salt. Put the mixture in your fridge. After putting the mixture in the fridge, put a cup of olive oil as well as a large pink grapefruit out so they will start to warm up. At 6 pm, have around ¾ of a cup of the Epsom salt mix. If you want to improve the taste, you can add a bit of vitamin C powder. Have another serving of the drink at 8 pm. Make a drink containing a half cup each of squeezed grapefruit juice and olive oil, being sure to shake the mixture. Try to go to the bathroom and then have the drink at around 10 pm while standing. Take four Omithine capsules at the same time and then lie down on your bed with your head on pillows for elevation. When you wake up in the morning, have ¾ cup of the Epsom salt mixture and go back to bed. Two hours later take the last ¾ cup dose. Don’t start eating until two hours later and start with fruit juice. You can add fruit in 30 minutes and light foods after an hour. At some point you should have whey powder to make up for bile salts you lost. Eat dinner as normal but be ready for diarrhea. The day you plan to do your detox, be sure to have no fat during both breakfast and lunch. Some ideas for meals that don’t include fat are toast and honey, cooked cereal and vegetables. You should stop drinking and eating by 2 pm at the latest. To reduce the risk of nausea, do a kidney cleanse before you detox using Epsom salts. To improve your liver health, consume milk thistle supplements after your detox. It is very easy to make a laxative with Epsom salts as you only need the salt and a bit of water. Add between one and two teaspoons of Epsom salt to a cup (8 ounces) of water. Stir the mixture well before drinking it. If you would like to add a bit of a tangy flavor, you can squirt in a lemon or add some orange juice. Have your drink twice each day waiting four hours between doses. Be patient and stay close to the bathroom as it can take anywhere from 30 minutes to six hours to start working. Take a look at your Epsom salt packet for more detailed instructions. Keep in mind that the amount of salt you use will depend on your age. Never have more than 2 doses of the Epsom salt solution in a day. Taking more of it will not provide the laxative effect more quickly. 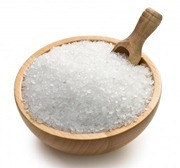 Because Epsom salts work effectively as laxatives, they will completely cleanse your colon. This means that you should drink plenty of water throughout the process to help prevent dehydration. Magnesium as well as sulfate is crucial for body functions including inflammation reduction, energy production, nutrient absorption, toxin elimination and muscle control. The FDA approves using Epsom salts as a laxative but you should pay attention to quantities and be aware of the side effects. Keep in mind that each tablespoon Epsom salt has 3.4 grams of the element magnesium but the recommended daily allowance is only between 300 and 400 mg. Therefore if you have too much Epsom salt regularly, you may develop magnesium toxicity. This can include breathing trouble, chronic diarrhea, fatigue and in some cases even death. If you have any stomach issues such as bloating, abdominal cramping, vomiting or nausea, you should avoid using Epsom salts. Although there isn’t any evidence that the salts can damage a fetus, you should not take them if you are pregnant or breastfeeding or if you have kidney problems. If you are on any prescription medications, you should also make sure they don’t contain magnesium. Epsom salts work very well as laxatives but it is important to be aware of the side effects of taking them internally (these are not an issue for use in baths). You can also use other natural laxatives to relieve your constipation. Always talk to your doctor before using Epsom salts.